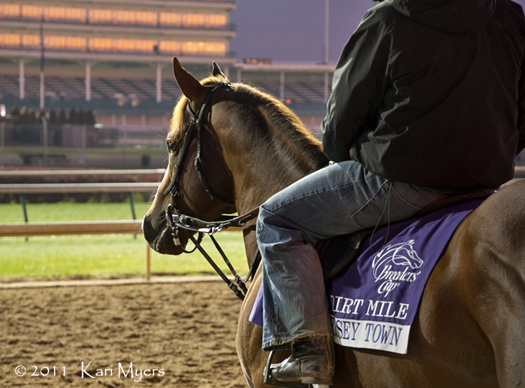 November 2, 2011: Jersey Town in the pre-dawn hours at Churchill Downs awaiting his turn for a gallop. There have been a number of retirements announced lately, just as there are at the end of every year. However, there are some I’ll miss more than others. Jersey Town is one of those. Trainer Barclay Tagg scratched him from the Cigar Mile on Saturday with a fever, and they made the decision to go ahead and retire him instead of pointing towards another race. I certainly can’t blame them for that, since he’s just about to turn 7. He’s off to stand at Darby Dan alongside one of his more recent rivals, Shackleford. Perhaps they’ll have paddocks near each other, where they can relive some of their races. They ran against each other four times, so I’m sure they’ve got tons to talk about. Jersey Town started off his career at age 3 in 2009 by winning at first asking in a maiden claiming race for a $25,000 tag. He went on to run 21 times with 6 firsts, 8 seconds, 3 thirds, and career earnings of almost $820,000. He won the Grade 1 Cigar Mile in ’10 and the Grade 2 Kelso this year, beating the likes of Shackleford, To Honor and Serve, and Tapizar. His final race was a 5th in this year’s Breeders’ Cup Dirt Mile. Jersey Town’s dam, Jersey Girl, was quite the race horse herself. She won 9 out of 11 starts, including three Grade 1 races: the Mother Goose, Test, and Acorn. So here’s hoping that Jersey Town has a long stud career and can pass on some of his family’s talent and charisma to his babies!